when i get on a sugar kick i’m like buddy the elf! and during the holidays i always loosen up a bit and eat more of the stuff i generally try to avoid- refined sugar, white flour, processed goodies! its yummy fun but i also find that after a few weeks of treating myself my regular food doesn’t taste nearly as good as it used to. which means it’s time for a cleanse! so i return to really clean eating- lots of juicing, fruits and vegetables. but i inevitably miss the sweets. that’s why i knew the second i spotted this that i had my answer. a raw cookie with no sugar, no flour, no processing at all? genius i tell you, genius! 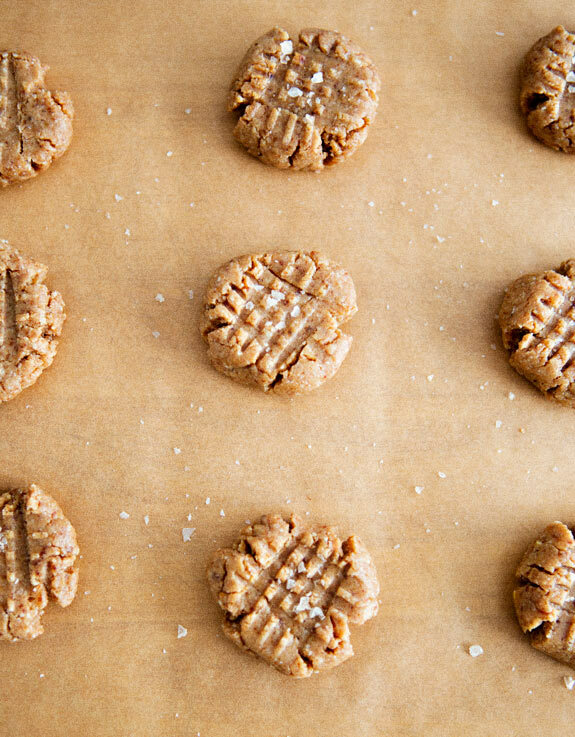 they aren’t the same as a true dry, flaky peanut butter cookie but they’re close enough for me! and the best part: after eating one i feel satisfied instead of feeling like i probably need to eat three more. that sugar addiction, it’s a crazy thing! i hope you love them as much as i do! *i was concerned about the motor in our food processor being overworked so i used the dry container in our vitamix to break down the almonds into a pasty flour before i added everything to the food processor. almond flour could also be substituted if you don’t have access to a vitamix! Mmm, these look delicious! I eat vegan at home, but I've never been one for raw baked goods… these look good enough to break that rule, though. We are currently doing a juice fast to combat this exact thing. Sugar is my nemesis. I can't even begin to tell you how bad it got after my holiday home madness. Okay, candy bars for breakfast & dinner! oof. Anyway, when we're off the juicing this looks like the perfect treat to satisfy and keep me from slipping back into the wild, wild world of sugar highs and lows. PS glad to hear you got that mojo back lady! here, here! @anni, i hope you like them! i am always skeptical about raw foods but i have been happily surprised a bunch lately! Not only do these cookies LOOK gorgeous, but I bet they also taste incredible! And with no added sugar or white flour? Count me in! … The runner in my is rejoicing, as I think this recipe might be the perfect kind of pick-me-up I need this winter to get moving again and satisfying that sweet tooth of mine without completely undoing all the good done from my runs. And peanut butter after a run? The absolute BEST. Thanks for sharing! Gorgeous blog! I don't have a food processor, can you do all of the work in the vitamix? Have you tried? I was thinking of trying, but wanted to know what you thought! hi sarah! i think i'd give it a try…do you have the dry container for the vitamix? if so, start with the almonds in that. then add the vanilla and dates to see if you can get a good mixture going. peanut butter last, that way if it's not working you can hand mix it the rest of the way! 🙂 good luck! @sarah- wait! i forgot to mention… go slow and give your vitamix breaks in between. you don't want to burn out the motor! Can I just use almond flour or do I need to make my own? If I use almond flour, how much would I need…1 cup of flour or 1/2 cup? hi clare! i think you can use almond flour. i'd use one cup and add peanut butter if it's not sticky enough. 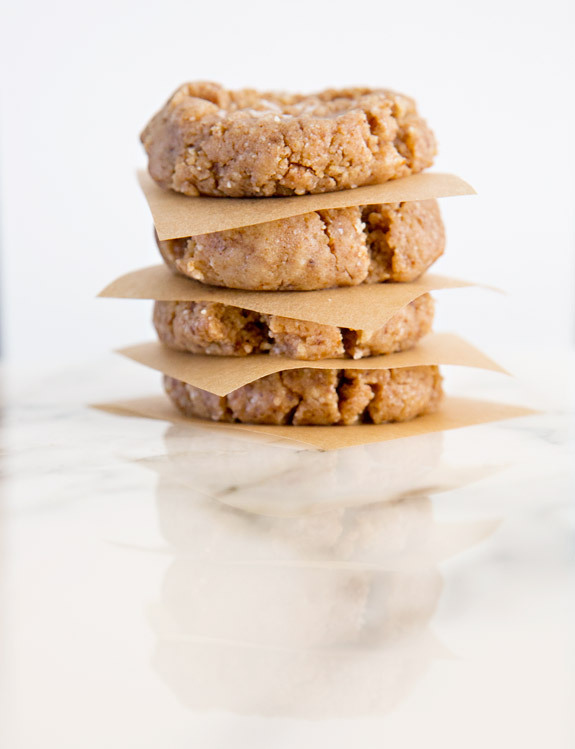 These raw peanut butter cookies with dates are fantastic! Can you substitute anything for the dates? @anna, i'm not sure what you could use that would act as a sweetner but also have the consistency needed. you don't taste the dates at all if that's what you're worried about! Did you use a natural nut butter for these? I'd like to sub almond butter and would think it should work just fine if you used natural peanut butter, as opposed to a processed one (Jif, etc.). Thanks! Hi, thank you for tracking the nutritional analysis. I was curious, how many cookies did you enter for the servings? Thanks! Just wanted to post back since I went ahead and made these this afternoon. First, delicious! I subbed almond butter and they turned out fantastic. I also added just a bit of cinnamon, maybe 1/4 to 1/2 teaspoon. I can't wait to have one for dessert tomorrow after the flavors have had some time to meld. One change I would make, process the dates prior to adding the other ingredients. They broke down a lot more easily that way and blended into the other ingredients better. I also used 1 cup of almond flour instead of whole almonds, since I don't have a vitamix. The proportions were perfect! yum, just made a batch. i added in some walnuts, pepitas & chia seeds, plus raw cacao nibs. thanks for the inspiration! @k- that sound amazing! thanks for sharing! Made 'em! Love 'em! Used almond extract for an extra kick…yum either way! They are no bake, but they aren't actually raw in the strict sense, as your peanut butter would contain roasted peanuts. but you could substitute raw cashew butter or raw almond butter in its place! hi van van vegan! not all peanut butter is made of roasted peanuts, so raw peanut butter is fine! thanks for the suggestions for almond butter or cashew butter though. I made these today and they are amazing! I did 1/2 almonds and 1/2 cashews. I added about a 1/2 tsp of sea salt in the actual batter instead of putting it on top. I also added a little bit of water because I was afraid they were a little too dry. I don't think I would need to do that next time; I just panicked! I'm bringing these to work tomorrow. I think they'll be a hit! They really taste like a peanut butter cookie! Will make again. Thanks for sharing! SO delicious! They didn't last but a week in my house! I wonder if figs would work well instead of dates? They are a little cheaper than dates so I might see how that goes. I wonder if I could use walnuts instead of almonds? I just made these last night and they came out delicious! Fast and easy! Thanks for the recipe! Making these for my vacation! Do you think they will pack well? hi ashley! i think it depends, for a long trip maybe not. a shorter trip where you can pop them back in a cold fridge at the end- definitely! let us know how it goes! Aww. These are like glue. At least after freezing for several hours, I could get them to press down with the fork tines. But I don't know what definition of cookies they could meet. Maybe it would be less disappointing to call them Date Nut truffles or something. hi andrea! sorry to hear that you had such a bad experience. maybe the ingredients were different or something got mixed up somewhere along the way? they shouldn't be hard at all! if you read the other comments they've been a hit so far! These were fantastic. I didn't have dates on hand, so tried raisins and they turned out great. Looks like you could also roll these into little balls and add to vegan ice cream (churned frozen bananas) and make your own cookie dough ice cream. I made these last night and they were THE SHIZ!! So amazing! The first one i ate forgetting the sprinkle of salt..
and the second one i had it with salt, and it just finished off very nicely!! So grateful for this recipe, Thank you! enjoyment, for the reason that this this web site conations genuinely nice funny material too. These are awesome! I used 1/2c. almond flour instead of the almonds. The kids fought over the last one and my 20 month old stole the last bit and shoved it in her mouth. Quite the scene. Needless to say the cookies didn’t last but 15 minutes, so we never got a chance to see what they were like after sitting in the fridge for a bit. Wow, just made these today and we LOVE them! Thanks so much for sharing! as well and tell me your opinion. to looking over your web page for a second time. So excited to have found your site!! Before I put these in the fridge they tasted like cookie dough. I cannot wait to have one, okay probably 2 for breakfast! Thanks for sharing your skills. website!I guess its ok to make use of a few of your ideas!! That is the proper blog for anyone who needs to seek out out about this topic. You understand so much its almost arduous to argue with you (not that I truly would want…HaHa). The cookies are DELICIOUS – even though I forgot to put in the vanilla. The salt on top really makes them extra good. I ended up needing to add about an extra 1/4 cup peanut butter to get them to hold together. These taste good but are super crumbly and break apart when you are trying to eat them. I ate a couple with a dark chocolate square. yum. 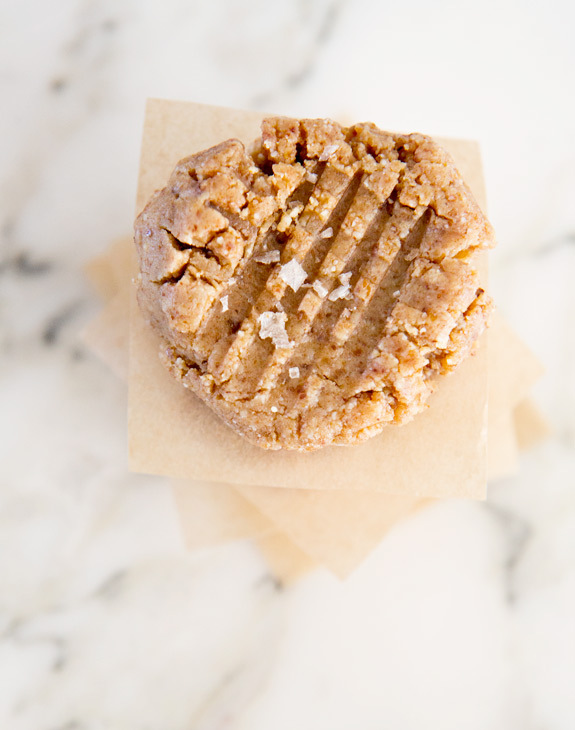 I made these cookies with almond butter and I love them for a quick mid morning snack. Can you tell me the nutritional values since I am trying to keep track of protein and calories. website, and it’s a frequent theme of keynote speakers. Hi there! I’m allergic to Almonds. Would cashews work for this recipe? Hi—do you have the nutrition facts for this recipe?